Since 1958, Nub's Nob has been doing what it does best: providing a great family place to ski and place. Today, Nub's Nob offers 53 ski slopes and trails on three separate peaks, friendly staff, fresh homemade food, an award winning lodge and a decorated snow making and snow grooming crew. 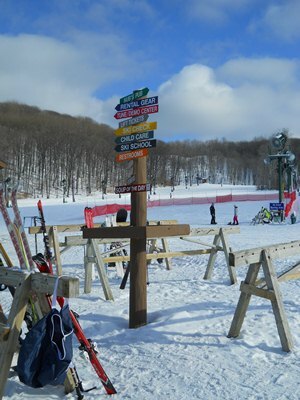 Located just outside Harbor Springs in the "ski valley" with Boyne Highlands just across the valley, Nub's Nob provides first class and friendly skier in a spectacular setting. Fun? You bet! With a free beginner's area, first time skiers can practice with confidence. A ski school, ski rentals, childcare, NASTAR, ski league events, night skiing, cross country ski trails (included a loop with lights for night skiing), snowboard and terrain park--what else do you need? The ski lodge serves up great food by the fireplace. Sip a hot coffee or step into the bar and watch the skiers zip down the hills in front of you. Snow making--spectacular snow making--means you can be on the hills early in the season. If you live outside of Northern Michigan and don't see snow in your backyard during the winter, there is always snow at Nub's Nob! Northern Michigan skiing at its best!